The First Monthly Alcohol and Alchemy was a success, with a heap-load of liquor-laced hot chocolates being guzzled to and fro while Frank Sinatra crooned Christmas songs between short features put on by The Super Fun Film Society. NEXT Alcohol and Alchemy night: Tuesday January 6th!!! 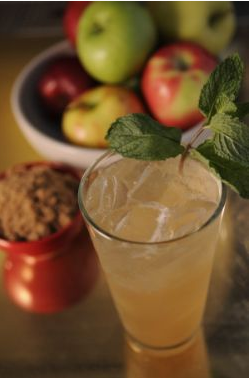 The drink of great machinations and effort will be the Apple Cider Mojito (served cold) which is a painstaking process with this crazy recipe that Tom will undertake the night before the event. We will also be making HOT apple cider drinks with various liquor-mixes. Add lime juice, apple mint brown sugar, and rum to a cocktail shaker filled with ice. Shake 8 times and and strain into a pint glass filled with ice. Top with club soda. Garnish with a sprig of mint. *Making your own apple mint brown sugar is way easier than you think. Plus, this recipe makes a big ol’ batch of the stuff so you can whip these things out with the greatest of ease once this task is out of the way. Bring 3 quarts of unfiltered apple cider, 3 quarts of brown sugar, and 12 apples (cubed) to a simmer for 15 minutes. Remove from heat, strain out apple chunks, and add roughly torn mint leaves (no stems) and let steep for 15 minutes. Strain mint, cool, and refrigerate. December 9th’s Alcohol and Alchemy was hot chocolate…and it was AWESOME. Very well attended and a lot of chocolate goodness was consumed. This entry was posted in Uncategorized and tagged alcohol and alchemy, cafe, canada, detroit, entertainment, events, indie, live music, lounge, ontario, phog, venue, windsor. Bookmark the permalink. 1 Response to Alcohol and Alchemy: SUCCESS! you’re strained, cooled and refrigerated Tom!